I last posted about a place that I and many others just refer to as "Up North." It holds a special place in my heart and the hearts of my family, both immediate and extended. As I mentioned, I had a chance to fish with my daughter, Sarah, when I was up there. She was looking forward to getting out on the water in my buddy Steve's boat to hopefully catch some bass and spend time with us. 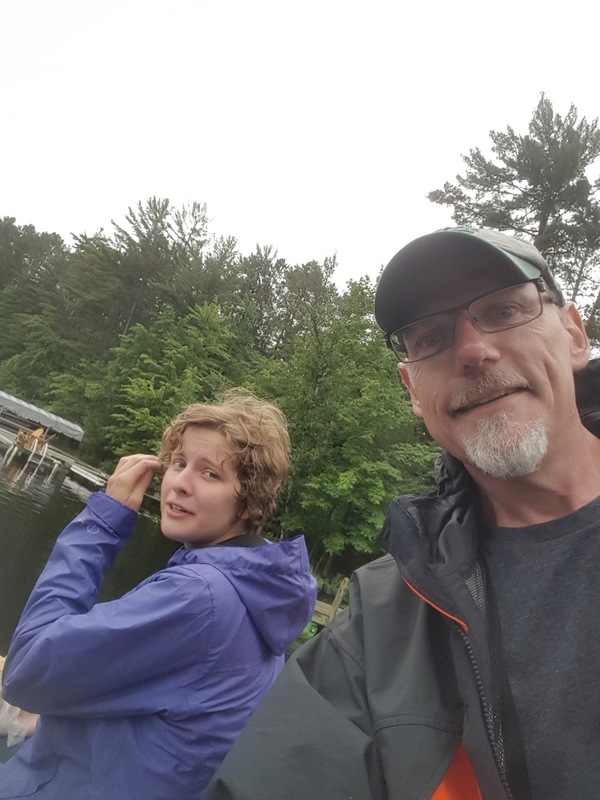 We met at the launch of Eagle Lake in Conover, hugged and got ready to launch the boat. Once we got it in the water, Steve struggled a bit trying to start the motor. On the fifth pull, the engine started and Steve stood there with the ripcord dangling in his hand. Like any good motor, the ripcord is supposed to retract and, more importantly, it's supposed to stay attached to the motor. Steve looked at me like a deer in the headlights. Sarah and I looked at him and laughed that tragic sort of laugh when something so bad happens that you can only laugh. I think I may have said, "I don't like the looks of that!" Shortly after that it began to rain. Because, like the old saying, when it rains it pours. Luckily, he brought his tools, which he went and retrieved. In a half hour he had the thing running like it should. So we set out in the rain and fished for 3 hours. We had some great laughs and the only one who caught fish was Steve. But the thing that struck me most was that I did not hear one complaint from my daughter the whole time. Not about the broken motor. Not about the rain. Not about the fishing line snags. Not about the cold. By the end of the afternoon her jeans were soaked, but she kept on fishing. Because she's my daughter. Like me, she's obsessed with fishing. Like me, she's experienced the adverse conditions of remote places like the Boundary Waters. I think she even said "A little rain never hurt anyone." She told me a story about her roommate Nate who is working with her at her internship. She said the two of them went fishing in the canoe and needed an anchor. She corrected Nate on how to tie a rock to a rope so it would hold. She said "I've seen my dad do this a hundred times in the Boundary Waters." It kinda made my heart soar with pride. You work with your kids to raise them right and show them the beauty and majesty of the great outdoors. You teach them to try and be no-nonsense/no drama kinds of people. You tell them to be polite, engaging and work hard. And when they come to be adults and begin to reflect many of the values you try and instill and you see that they've become all grown up, well, there's nothing much better than that.